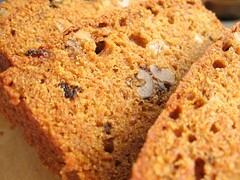 Carrot Bread - Do You Know The Muffin Man? Notes: My first recipe out of this cookbook (which is currently on the discount table at Book City in Toronto and available at bookcloseouts.com online). I like how she gives volume, and Imperial and metric weights for every recipe. There's also a little paragraph called Understanding which explains some of the science or ingredient choices. For example, in this recipe, she says that the zucchini variation requires a bit more flour because carrots have less water (88% vs. 94%). This quick bread is basically carrot cake in a loaf pan, nice and moist and made interesting with raisins and whole walnuts.